The economics of growth has been one of the most popular and controversial fields of macroeconomics. Over the years, economics has undergone a socio-historic evolution from being solely focused on growth to involve development as well. This evolution, along with the increasing popularity of welfare economics and research, necessitates differentiation between growth and development as well as between equity and equality. It is the ambit of ‘welfare’ that distinguishes development from growth. The terms ‘equality’ and ‘equity’ situate themselves in the gulf between social and private benefit. Of late, researchers are going beyond just projecting growth rates, to determining income distribution in a society and arriving at optimum values for social welfare functions. Social crises now have an economic explanation. This leads to a very important question: does economic inequality lead to social conflict? Though citizens (or commons) have started reacting to economic crises, only the state has the legitimate authority to pass laws against any conflict or inequality. This leads to many obvious questions. What is the scope of state policy in the time of conflict? Is redistribution the most effective policy option? Or does that just treat the symptom, not directly striking the disease of inequality? State policy is not without its share of institutional dilemmas. Often, laws of various confederations formed to maximise growth and development act as constraints in times of crises. The Euro-zone, aiming to avoid harmful competition and reach a cooperative equilibrium, implemented a single currency system. This was intended to result in a strong Euro. The benefits of the strength of the currency were to go to the poorer of the European Union members. With the near collapse of Greek economy and rising civil unrest (owing largely to global recession and the Greek debt crisis), economists now wonder if the crisis could have been managed better if Greece had its sovereign currency. The World Trade Organization regulations decrying protectionism act as further example of restrictions imposed on individual nations that prevent internal crises management. Such debate and discussion leads us to one all-encompassing question. 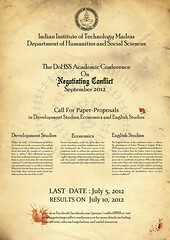 Do institutional dilemmas impede policy effectiveness in times of conflict? If so, how can this be fixed? Does economic inequality cause conflict? A theoretical analysis, supported with empirical findings in literature. What is the scope of state policy in the time of such conflict? How should the state form policy to address the inequality? The institutional dilemmas associated with state policy. A discussion of the institutional dilemmas, on the possible solutions, supported with logical reasons. This entry was posted in Header Menu and tagged Conflict, Economics, Header Menu. Bookmark the permalink.